Doing a job that is in high demand helps to make immigration a success. Many Occupations that the country needs are not filled up by the local labors. By having such jobs, an employer needs arranging the Labor Market Impact Assessment document. It also shows that your job is not be filled by a local Canadian. Additionally, many provinces/territories have introduced visa programs that cater to top demand occupations specifically. Thorough networking is a fine way to help make immigration smoother. It can be done in a professional manner or through informal channels. The relatives/family friends presently residing in Canada can help if they know a person ready to hire. The person who you know often helps to get a job in Canada. Explore formal job fairs, and also participate in online forums and business events. Also, find someone who works in a specific field like yours and who can point out regarding getting a start. Approach the people in a calm and confident manner. Today many do not search for employees through the system of hiring recruiters. The seekers have to look out for Recruiting Sites based on the job sphere. Take care to apply to the right recruitment sites. Also, upload all details and information about the job description and work experience, and supply samples of work accompanying the CV. Update the details before uploading them. Candidates, who have the right skill set, get the right job offer from recruiters that fit the current level. Additionally, they show an interest in finding the apt and exact type of employee for the right business. Be polite and timely while replying to recruiters. Also, create a good first impression. Many potential employers check out the social media accounts of future employees. Create a favorable impression of work ethics. Do not have an overpowering or a very small presence on social media. Furthermore, online websites, especially LinkedIn, allow a professional to make online recommendations from coworkers. Such recommendations add weight to the applications. They also enhance the credibility of applicants. 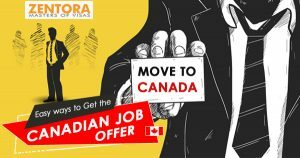 Furthermore, a few immigration programs allow a person to move to Canada before having a job offer. Through the Provincial Nominee Programs of Canada, one can apply to become a Canada PR of the province. In turn, it also helps to become a full citizen of the country. Applicants can also hunt for a job offer from local employers because there is an increasing elderly workforce. Additionally, the country needs new employees having the work experience and right skills necessary for the province/territory. A job offer is valid only when the employment is for a full-time post. It must also be for the duration of one year and contain a Job title; assigning Duties and responsibilities; job Requirements; Duration of employment; Amount of salary/, wages and finally, Name, address, and contact information of the company. Having a job offer also gets a high score in certain systems of immigration. In The Express Entry system, candidates earn additional points on the CRS 50 points for any job having a presence in NOC level A, B or C. In case of a job in NOC level of 0 or 00 the additional points are 200.